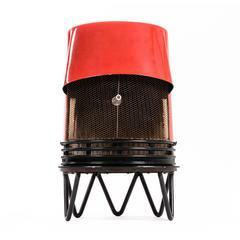 This wood stove was designed by architectural firm Hoff & Windinge for Tasso Denmark, circa 1942. The fireplace has a removable grate, Hairpin legs and is marked Tasso Denmark This a real Modernist piece. Bookcase by Arne Vodder for Sibast Danish design bookcase in rosewood. Four shelves, you are able to change the heights of the shelves. Minimalistic rare sideboard designed by the Dutch modernist Cees Braakman for Pastoe. Teak veneered, and black metal feet feels like the Japanese series from Pastoe. Rare Danish fireplace designed by Hoff & Windinge in 1942. Removable grate with ash drawer. Hairpin legs, marked made in Denmark. Rare Danish fireplace designed by Hoff & Windinge in 1942. Removable grate with ash drawer. Adjustable chimney chute, on hairpin legs. • Steel • Black porcelain finish • Freestanding • 20th century • American • Measures: 32" W x 20" D x 82" H.
Super groovy Brutalist faux fireplace by Adrian Pearsall. With a height of just over 8ft. It will make a statement in any room. Comes with faux light up logs.